Background: Bobolink and Eastern Meadowlark populations have declined substantially in Canada since 1970. Both species breed in grassland-like environments including hay fields, pastures, fallow fields, and remnant grasslands. Despite ongoing research on these two species, basic questions persist regarding associations between habitat use during the breeding season and characteristics of the landscape (e.g., percent of nearby grassland cover). Project work: In collaboration with Katherine Robbins, a master’s student at Memorial University, we conducted point count surveys across four watersheds in southern Ontario to learn more about habitat use and landscape characteristics that influence the occurrence of Bobolink and Eastern Meadowlark. We sampled across land cover types (i.e., hay fields, pastures, grain fields) and an expected gradient of abundance based on the second Ontario Breeding Bird Atlas. Our results indicated that the proportion of hay and pasture within 5 km of survey locations was a good predictor of Eastern Meadowlark habitat use. We were unable to identify a good predictor of Bobolink habitat use, despite our analyses of variables suggested in the scientific literature (e.g., proportion of nearby hay and pasture, patch size, amount of patch edge). Conservation implications: The relationship between Eastern Meadowlark habitat use and proportion of hay and pasture land cover could be useful for conservation planning. 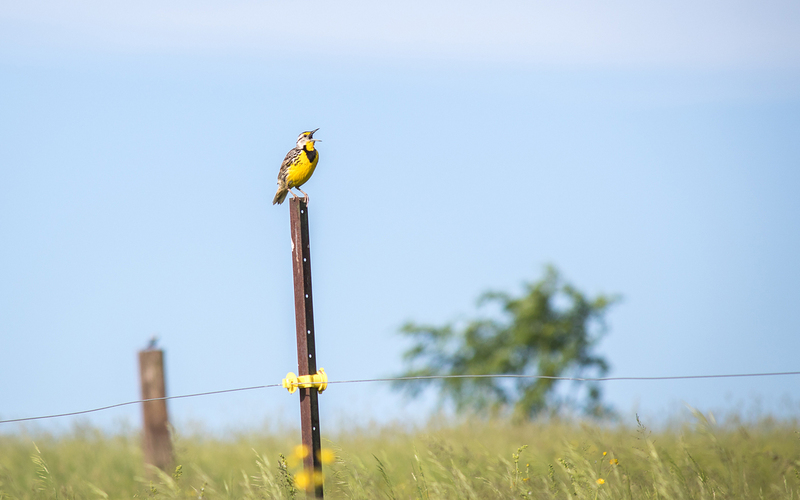 For example, conservation programs could focus on working with farmers to reduce the impacts of grazing and hay cutting in regions with high probability of Eastern Meadowlark habitat use. Focusing on regions with high probability of use would likely benefit more birds than similar efforts in regions with low probability of use. Conservation programs could also encourage the expansion of hay and pasture land cover in regions with moderate probability of use to potentially increase probability of use in such regions. Monitoring the ecological response of Eastern Meadowlark to such programs would benefit the scientific and conservation communities by providing the information needed to evaluate current programs and guide future conservation efforts. Funding: Support for this project was provided by the Government of Ontario, Mitacs, and the CICan Clean Tech Internships program.